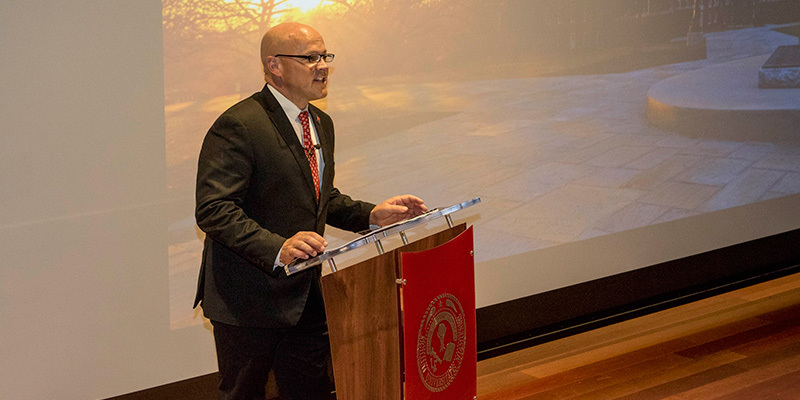 Miami University President Gregory Crawford spoke about advancing the university’s purpose in today’s world during his 2018 Annual Address. Miami’s No. 3 ranking in U.S. News and World Report for its commitment to undergraduate teaching. Miami earned the most in research funding in a decade, and one third more than last year. More than 280 undergraduates from 10 departments were published in peer-reviewed publications last year. The Howe Center for Writing Excellence, a distinctive part of a Miami education, surpassing 42,000 student visits since it opened in 2007. Crawford announced that the Boldly Creative Strategic Academic Enrichment Initiative received 36 pre-proposals from faculty teams. He congratulated all Miamians for reaching ambitious goals of the Miami 2020 plan by achieving more partnerships, advanced retention rates, enhanced diversity, more multiple majors and more study abroad participation. Crawford introduced a new Strategic Planning Committee to be co-chaired by Julia Guichard, professor and chair of theatre, and Bob Applebaum, professor of sociology and gerontology. Subcommittees will address six priorities: academic excellence; research and scholarly success; transformational student experience; diversity, inclusion and community; financial and resource sustainability; and Miami as a national university. View the president’s speech online at Facebook. A full text of his speech is available on President Crawford’s webpage.